The Airflows were facelifted again for 1936, with revised grilles and all-steel roofs. Sedans now had integral trunks with internal spare-tire storage. The interiors were also revised, eliminating some of the previous Streamline Moderne touches, like the chromed seat rails. Reflecting the slow sales, the model lineup was simplified, as well, eliminating the business coupes and the Town Sedans, with their blind quarter panels. The big CW Airflow Custom Imperial was no longer listed, although about 10 were built as special orders. Prices of both the basic Chrysler C-9 Airflow Eight and DeSoto Model S2 “Airflow II” were up as much as $150 for 1936, which put them in a very awkward market position. The six-cylinder DeSoto cost as much as a Packard One Twenty, which had a straight eight, 20 more horsepower (15 kW more), and the snob appeal of the Packard name. The Chrysler Airflow, meanwhile, competed directly with the new Lincoln Zephyr, which had a V-12 engine, a superior power-to-weight ratio, and styling that had been much better received. Interestingly, most 1936 Chrysler Airflow buyers opted for the pricier C-10 Imperial. Starting at $1,475, the C-10 was more expensive than the Zephyr, but noticeably larger and considerably more powerful. While Lincoln sold around 15,000 Zephyrs and Packard more than 55,000 One Twenties in 1936, Airflow production amounted to only 6,285 Chryslers and 5,000 DeSotos. It was the sole black mark in what was otherwise a spectacular year for Chrysler: Plymouth sales topped half a million units and even Chrysler sold nearly 60,000 cars, thanks mainly to the handsomely facelifted 1936 Airstreams. Chrysler’s total production surpassed Ford’s for the first time and the corporation posted a net profit of $62.1 million, enough to repay the last of the debt Chrysler had assumed when it acquired Dodge in 1928. The dismal sales of the Airflow II were apparently the last straw for DeSoto president Byron Foy and the DeSoto Airflow disappeared after 1936. The writing was on the wall for the Chrysler version as well, but it returned for one final encore, offered only in a single series. 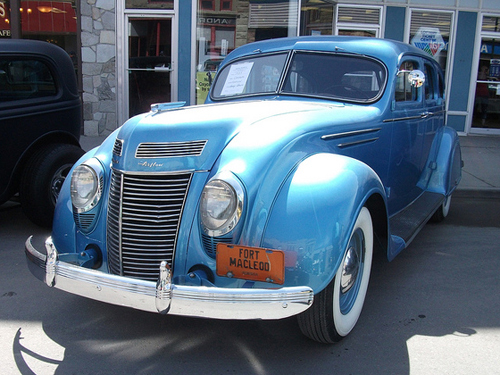 Since the C-10 Imperial had been 1936’s best seller, the 1937 C-17 Airflow was essentially that model, fitted with new trim and yet another new hood and grille, similar to those of Chrysler’s conventionally styled cars. However, the C-17 was no longer listed as an Imperial. 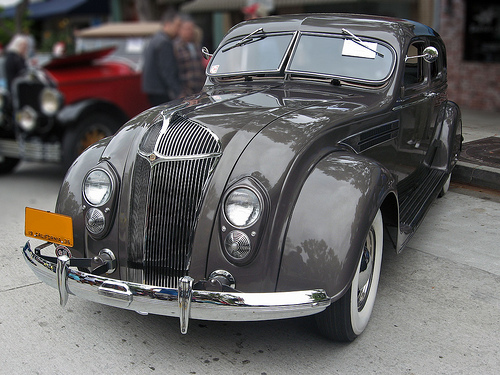 For 1937, Chrysler had applied the Imperial name to all of its non-Airflow eight-cylinder cars, probably as a belated response to the Packard One Twenty. 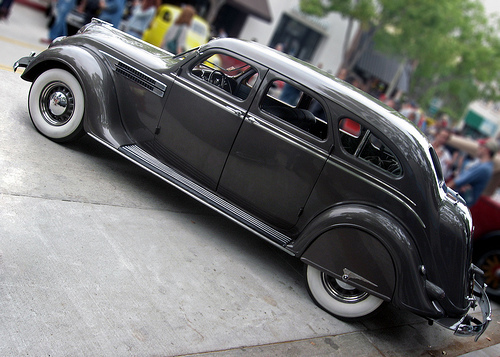 There was now a separate, conventionally styled Custom Imperial, although at least two CW Custom Imperials were updated with 1937 Airflow grilles, hoods, and bumpers. One was for Philippines president Manuel Quezón while the other was built for Edward Bowes, host of the popular CBS radio show Major Bowes Amateur Hour, of which Chrysler had recently become the sponsor. Sales of the C-17 were very similar to the previous year’s C-10 Airflow Imperial: exactly 4,600 units, 95% of which were four-door sedans. The last was built in October 1937, bringing the final tally of Airflow production to 55,655 cars (or fewer, depending on which 1934 figures you believe). With that, the Airflow was dead, although Carl Breer’s group continued to use earlier models for aerodynamic research through at least 1941. The radial-engined, FWD mini-Airflow never got off the ground despite extensive development work and road testing. Chrysler tried to find a foreign licensee for the design in 1938, but with war brewing in Europe, they were unsuccessful. At least one of the two prototypes was eventually scrapped. Conventional wisdom holds that the Airflow failed commercially because it was too advanced — that American buyers were simply not ready for functionally (as opposed to cosmetically) streamlined cars. However, even if we discount the popularity of the Peugeot 402 and its smaller 302 and 202 derivatives, the problem with that theory is the Lincoln Zephyr. The Zephyr’s exterior design and bridge-and-truss construction were just as radical as the Airflow’s, it certainly wasn’t any cheaper, and it had a variety of significant flaws. Nonetheless, it sold around 133,000 units between 1938 and 1942 and spawned the first Lincoln Continental. Clearly, buyers in that price range were not wholly opposed to aerodynamic design. A wonderful article. I still have some very vivid memories of the Pennsylvania AACA vintage car shows back in the 1970’s when a couple of Chrysler Airflows would show up. And definitely got noticed, unlike my personal ’37 Buick Special. Now, how about some follow-up! I’d love to see an article on the Lincoln Zephyr, and would especially love to see something on the Hupp Aerodynamic’s of 1934-35. The 1937 Ford wouldn’t be out of line, either. The mid-30’s were definitely a wonderful time for automotive design. I’d like to second the earlier commenter, the mid ’30s to early ’40s period really was a fascinating early golden age in automotive styling, where for the first time styling really was given a high priority over the more utilitarian looks of the 20s-early 30s, even if the customers of the day didn’t always go for the more radical examples of streamlined Art Deco, as was the case with the Airflow and shark nose Grahams. Although I appreciate the need to jump around a bit for variety, please do consider more articles on the ’30s streamliners in the future, as it is such a fertile era. – the Cord 810/812 would be a great read. As an aside, I read an article a few years back about an architect or fashion designer (some creative professional) in Manhattan who had a really special custom CW restomod built, taking an original Airflow body and interior and retrofitting it with a modern drivetrain and undercarriage, apparently the owner loved the Art Deco style and was using it as a daily driver in the city. Wish I had saved the article, but as I recall, there weren’t many pictures with it, but definitely an interesting project. Very interesting as always Aaron, I had a passing knowledge of the Airflows but it is great to read about the detail – I can’t imagine more than a few current cars would warrant the same attention! I saw a 1934 Airflow last year (with flat camera batteries!) and I remember previously one of the later model ones with what was quite evidently a tacked-on traditional grille. Looking at the photos perhaps what made the car look so jarring is the horizontal line of the hood which gives the optical illusion that the nose of the car is higher than the cowl, and I find the 6cyl cars better looking because the shorter nose lessens that impact. On the point that aero design per se was not sales-proof perhaps a slight taper for a less bulbous appearance, and wider-set headlights, would have made a difference? Rob it would be interesting to hear more about that car too. I hadn’t thought about the nose seeming higher than the cowl, but looking at the photos again, I see what you mean. It’s exacerbated by the position of the hood ornament, which gives the tip of the nose a bit of a ‘ski jump’ flair, even on the ’34s, where the original hood line actually slopes downward quite a bit. I imagine that is one of the factors that contributes to what I think of as a ‘stubby’ look to the whole car (especially sedans). The 1934 CU is quite a big car, but its rounded contours make it look smaller than it actually is, an effect that only the really long wheelbases of the CX and CW Imperials offset to any great degree. Deciding to mount the headlights in the leading edges of the body sides, rather than the fenders, was really limiting, both in spacing and light size. I don’t know why they didn’t mount the lights in the front fenders, as John Tjaarda did with the Zephyr. (The production Zephyr’s front end was mostly redone by Bob Gregorie, but the fender-mounted lights were on the original Briggs prototype.) I think the headlights of the ’36-’38 Zephyrs still look a bit awkward, but their spacing makes the Lincoln look lower and wider than the Airflow, even though it really isn’t. I imagine these are all reflections of the fact that the Airflow was [i]engineered[/i] more than actually [i]designed[/i]. The role of the stylists appears to have been to decorate the shape given them by the engineers, in which they had little if any say. Very nice article, Mr. Severson! I’m the president of the Airflow Club of America and I happened to find this site while searching for some other material. It’s nice to see a recent article about the Airflow. We are a small (425+) member club. We just had our National Meet in Durango, Colorado and I drove my 1935 C2 (Imperial) from Seattle WA. There are not many 76 year old cars which cruise smoothly down the road at 75 mph in overdrive. I did the return trip (1,300 miles) in two days. I own a 35 Packard, a 37 Cord and numerous other cars of the era and none can match the “modern” ride and drive of an Airflow. You are right, Engineering called the shots when the Airflow was designed. It was truly radical. Besides being quiet and smooth at 75 mph, it has gobs of art deco everywhere. The 6 cylinder cars (all DeSotos) are true to the Airflow spirit, but after riding in a prototype, Chrysler wanted an Airflow with his name on it. The Imperial Coupes are very well proportioned with six extra inches behind the B pillar. I am not opposed to rods, but if a CW was rodded it would break my heart so don’t verify it, please! In 1934, Chrysler did offer a retrofit grill which replaced the pure “waterfall” look with a more traditional grill – as was found on the ’35 models. With each passing year, as sales never materialized, Chrysler tried to make the front end look more conventional. Thanks again for a nice article! I’ve seen the story that the Airflow was originally intended [i]only[/i] as a six-cylinder DeSoto in a number of secondary sources. Do you have an original source for that account? As it stands, I’m afraid I’m rather skeptical of it. It’s true that the 1932 Trifon Special prototype was a DeSoto-size, six-cylinder car, and Carl Breer does say that he and Oliver Clark started with a six-cylinder model in laying out the packaging for the Airflow; they wanted to determine the minimum dimensions necessary to achieve both the aerodynamic profile and minimum passenger space they were looking for. However, Breer makes no mention of intending to [i]only[/i] offer the Airflow as a six, and his account indicated that the decision about which brands would offer it was made later. All he says on that subject is that they decided it would be sold by Chrysler and DeSoto; he says nothing about any plan to market it as a DeSoto-only product. Breer does say that Walter P. Chrysler was very excited about introducing the Airflow to celebrate Chrysler’s 10th anniversary. Based on Breer’s description of WPC’s enthusiasm for the project, it’s hard to conceive Chrysler [i]not[/i] wanting an Airflow with his name on it — if somebody suggested otherwise, I’m not sure who or why. From a business standpoint, certainly, offering the Airflow only as a DeSoto six wouldn’t have made much sense. The development costs were undoubtedly high, and DeSoto’s annual volume was not; it hadn’t topped 40,000 units since before the Crash. Also, even if there were some original plan to only offer it as a six, why didn’t the U.S. Chrysler line get the CY? Now, given the antipathy some of the corporation’s management apparently had toward the Airflow project, it’s entirely possible that getting the individual presidents to accept it was quite a battle. I suppose it’s possible that DeSoto president Byron Foy was less opposed than his colleagues; I really don’t know. However, my suspicion is that if there was a debate over who would offer the Airflow, it was more a matter of internal resistance than any overarching plan of what the Airflow should be. It would certainly be fair to call the six the baseline Airflow, since the larger eight-cylinder cars were created by splicing additional sections into the body panels and frame, but I don’t know that that means the bigger cars were somehow an afterthought. From Breer’s account, I think it was just easier to start with the smaller version, to establish the minimum package dimensions. That makes sense — if you know you have acceptable passenger room on the shorter wheelbase, it’s easy to make it bigger, whereas if you base your engineering on the larger version, it’s harder to scale it down without compromising utility space. If someone can point me toward a primary source for the DeSoto-only story — first-person accounts of the meeting where it was decided, etc. — I’ll happily accept that, but otherwise, I’m inclined to think that story may just be a misinterpretation of Carl Breer’s account, one that has, as they say, grown in the telling. I wholly agree on the CW. I’m not keen on the idea of heavily customizing the Airflow to begin with — it’s relatively rare, of obvious historical interest, and already pretty wild looking without any help — and the idea of cutting up a CW is the sort of thing that gives historians night terrors! I HAVE TWO CHRISTMAS CARDS FROM THE TRHEE MUSKETEERS . IS THERE OF ANY LOKING FOR THEM? In the text on page one, it states that the Rumpler Tropfenwagen was powered by a 2.5 W6. Is this a misprint of V6? Or was this a prelude to to todays W8 Volkswagen? Nope, that’s not a typo. The early Tropfenwagen had a 2,580 cc Siemens & Halske engine with three banks of two cylinders. I don’t think I’ve ever seen a picture of it, but I imagine it was rather bulky. I own a 1935 Chrysler Airstream c-6 Coupe. I’ve been able to determine thru internet research that there were 1975 like models made. What I can’t find is how many of them were standards and how many were deluxe. Does anyone know or know how I can find this info. The information I have indicates that the six-cylinder Airstream C-6 models weren’t grouped into standard and deluxe versions, only the CZ Airstream Eight. Your number is what I show for business coupe production, as well. with no horns & also a single wiper. I’m confused about the differences, could it be as simple as diff. options? What are your thoughts. 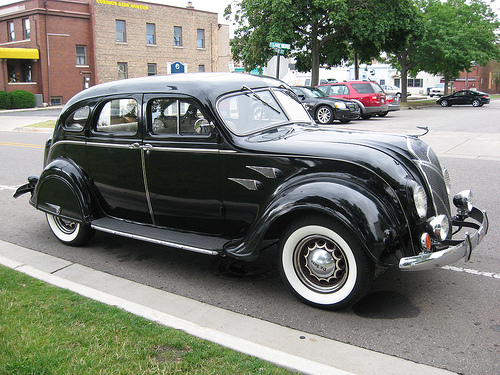 The Deluxe models were introduced after the start of the 1935 model year. At least on CZs, the dual horns were initially standard and then were deleted on non-Deluxe Eights when the Deluxe was introduced; the horn layout you describe sound like the early and late non-Deluxe CZ arrangements. Chrysler’s factory production figures don’t distinguish between Deluxe and non-Deluxe CZs, probably because of the midyear change. Now, I don’t know anything about a Deluxe version of the six-cylinder cars — all of that applies to the Eights. Is it possible that some of the confusing pictures you’ve seen were actually mislabeled CZs? A quick image search just now revealed at least once set of photos labeled as C-6s that are pretty clearly late CZ Deluxes (they even have the winged "8" badges on the catwalks) and there was definitely that variation with the eight-cylinder cars. I could see the parking lamps being a dealer or owner add-on, but the horns do seem like a production variation. Finally! The story of the Airflow in enough detail for me to understand these beautiful machines. Thank you for this piece! They may not have sold well, but their influence was certainly felt around the world. You mention the Volvo Carioca and the <i>Fuseau Sochaux</i> Peugeots (the last of which were made in 1949! ), but there is also the first “proper” car from the land of the rising sun: the 1936 Toyota AA. None survived, so Toyota actually built one for their museum in the 1990s. Along with Cords, Marmons, Franklins, shark-nose Grahams and the Zephyr, these Chryslers are the epitome of 30s American cars for me. I must admit had always been a little skeptical of the Toyota link, but the 2012 edition of Toyota’s official history specifically says the Toyoda Model AA took its inspiration from the Airflow. It wasn’t just the styling either; the engineers at Toyoda (not spun off of the parent company as Toyota Motor until 1937) recognized and sought to emulate what Breer and crew had done with the Airflow’s weight distribution and ride. Very interesting. I should add that while the Model AA was the first Toyota automobile, it was NOT the first Japanese car. The first Japanese-built four-wheeled automobile was made in 1904 and the first gasoline-powered car was in 1907. However, people really didn’t have enough money to create a sustainable domestic passenger car industry until much later. According to the numbers I’ve seen, it wasn’t until 1951 that Japanese companies built more than 2,000 passenger cars in a single calendar year. There is a rather long promotional video of the Airflow made by Chrysler in the mid-1930s that discusses its design and features, and includes a rather dramatic test rollover with a live driver. The roof of the vehicle remains completely intact as do all windows, although one rear door came open (they lacked interlocking door latches that have been required since the late 1960s). If you have not seen this, you should get a copy. I may have a video version if you cannot find one elsewhere. This video provides dramatic evidence that manufacturers could have provided good rollover protection in more recent decades without the advanced materials now used to meet FMVSS 216, and saved thousands of lives in rollovers (particularly of SUVs). Though only slightly connected to the article, is it known whether other more viable engines (e.g. inline, V-angle, Boxer, etc) were considered for the Chrysler Star Car in place of the five-cylinder radial-engine? It seems like a number of otherwise production worthy designs during that period up til the end of WW2 were fatally compromised by radial or other experimental engines. Also interested to know where one can find more information on Chrysler’s post-war small car project (including the name), which was intended to challenge the Chevrolet Cadet and the Ford Light Car project that eventually became the Vedette. To your first question, as far as I know, there were not. The “Star Cars” were FWD (if you look up the SIA article “MoPar’s Star Cars” on the Hemmings site, you’ll see some photos of the powertrain layout), which, like some early postwar FWD cars, was predicated on fitting the engine in a relatively short space ahead of the front axle. Short of the radial engine, that configuration would probably have dictated either an I-2, a V-4 or an H-4, with the latter probably being the most practical choice. Had Chrysler succeeded in finding overseas licensing interest, they might have gone that route, since for a non-experimental project, it’s hard to see a manufacturer considering the complexity of the five-cylinder radial worthwhile for an 1,100cc engine. The postwar concept you’re probably thinking of is Project A-106. I don’t have much detailed info on it; it was designed around an H-4 engine, but I don’t know the engine’s specifications beyond that. Indeed, the radial and other experimental engines considered by rivals were blind alleys. Agree about the production versions of the Star Car being powered by H-4 engines, though why didn’t Chrysler consider such an idea themselves instead of seeking out overseas licensing interests? Regarding Chrysler’s efforts in seeking overseas interest in the UK, know the likes of Stafford Gripps and others in the post-war Attlee wanted to establish a British people’s car project, supporting the stillborn efforts of Roy Fedden and Denis Kendall in setting up such their own car projects. Could an H-4 powered Star Car have remained in production after WW2 let alone achieve similar success to another similarly styled model whose engine layout / etc was at the rear? As far as I know, the Star Cars that were built were primarily experimental rather than development prototypes. With experimental designs, it’s not uncommon for a mule or set of mules to examine several different technologies at once, even if there isn’t any serious intent to build a production model that way. While an H-4 engine would probably have been a more promising design, it was no less radical for Chrysler in terms of actual production (having no relationship at all to any existing engine design), but less novel strictly from an engineering standpoint, offering less to be learned from experimentation. At that point, there wouldn’t have been a market for such a car in the U.S., at least in that form, and Chrysler didn’t have the export organization or local dealerships to offer it outside North America in meaningful quantities, especially given the complex tariffs and import duties involved in pre-EEC multinational productions. When the project began, Walter Chrysler was very enthusiastic about the Airflow and basically showing off what Chrysler engineering was capable of. Given the timing, my assumption is that the Star Cars amounted to dabbling in what they might do if they took some of the concepts involved in the Airflow a step or two further: FWD and a compact, easily removable powertrain. I can’t see Chrysler putting it into production in that form, but if the drivetrain and radial engine had shown promise AND if the Airflow had been a big hit, some of those concepts might have shown up in an Airflow successor. However, the Airflow was not a big hit, Chrysler management started getting nervous about these pie-in-the-sky engineering fancies and lost any interest in building such a thing. I think the effort to find a British licensee was at least partly a flailing attempt to recoup some of the substantial investment Chrysler had already made in the project rather than a coherent marketing strategy, which, combined with the timing, may have been why it didn’t pan out. I don’t know that comparative engineering strengths are a reliable predictor of commercial success. Some advanced designs fail despite their strengths, lacking other important characteristics like after-sale service or just being too costly to build. Some rudimentary or old-fashioned designs succeed because they’re reliable, familiar, or just well-marketed. So, it’s hard to judge potential success simply based on specifications without a sense of who a product would be marketed to, how well, and for what price. In the case of the Airflow, were there other more attractive styling proposals that Chrysler considered which could have worked in retrospect? Guess the following is admittingly a fantasy, it would have been interesting if a production worthy Star Car formed the basis for Chrysler’s UK division instead of them later acquiring Rootes. Well, as the article explains, the Airflow — and presumably the Star Cars — were primarily engineering designs, not styling ones. The role of Chrysler Art & Colour was to decorate the pre-approved shape (which they did pretty well, in my view), not to decide what it would look like; what today we’d probably call “detail styling.” Judging by the photos I’ve seen of the Airflow prototypes, the alternatives the engineers developed were arguably worse, although there’s a coupe design with a low-slung roof that would have pleased postwar customizers. Could actual stylists have come up with ways to apply the Airflow’s aerodynamic concepts in a more visually appealing way, and potentially on a smaller scale? Sure; the Peugeot was not an unattractive car for its day. Did Chrysler do that? Not so far as I know. Another significant consideration is that I remain convinced that part of the reason for the Airflow’s mediocre sales performance was that the Airflow cars were quite expensive. That’s an issue that would likely have affected the viability of something like the Star Car, especially vis-à-vis contemporary Ford of England offerings. What a first class article! Too bad the looks of the Airflow were so artless and indeed clumsy, and I say that as an engineer. Certainly the cars were expensive to produce, but a little exterior grace would perhaps have saved the sales day. You cover that aspect well in a reply comment above. On the little radial engine FWD project, I was unaware of it until now. So the radial multibank Sherman tank engine that Chrysler produced in WWII makes sense with its five 6 cylinder blocks. Not the same crank arrangement, but they knew it was a doable project and likely to succeed without protracted development time. Too bad for them that Ford produced a monster rival DOHC GAA V8 that eclipsed it. Surely the Ford had the most advanced cylinder head design for decades afterwards, a tour-de-force. Jags, Alfas, Mercedes and F1 engines did not have a narrow valve angle, direct-acting bucket tappets from the cam, and a central spark plug in a DOHC four-valve pentroof head, until Duckworth reinvented it for the FVA/DFV. Most engines have similar layouts today bar bucket tappets. The RR Merlin looks positively antediluvian by comparison.